The Nigerian National Petroleum Corporation (NNPC), has been charged to give special consideration to youths of the Niger Delta in the ongoing recruitment exercise. 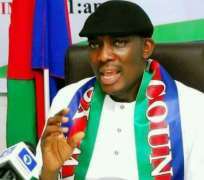 The appeal was made by the Ijaw Youth Council (IYC), President, Barr. Oweilaemie Pereotubo, to the Group Managing Director (GMD), of NNPC, Dr. Maikanti Kacalla Baru, particularly Ijaw youths who have sacrificed for the enduring peace in the region. Speaking to journalists Monday, the President who commended the giant strides of the GMD and his management team for their relentless efforts in repositioning the corporation which has necessitated recruitment of more workforce, appealed that youths of oil producing communities should be given priority attention considering the environmental pollution, pains and challenges these affected communities are suffering. Speaking further, Barr. Oweilaemie said IYC is always ready to partner and also help in whichever areas it's assistance is needed. He revealed to journalists that the relative peace in the Niger Delta is as a result of the collaborative efforts between IYC and other ethnic groups in the Niger Delta that have been engaging various youth groups to emphasize the overwhelming importance of peace.